Ukrainians carrying torchlights in commemoration of the 109th anniversary of the Organization of Ukrainian Nationalists (OUN) leader Stepan Bandera's birth in Kyiv have ended their event on Independence Square, or Maidan Nezalezhnosti. Members of the Svoboda Party, the Right Sector Organization, the National Corps with own flags walked from the Shevchenko Park to the Maidan, where politicians, activists and historians addressed the public from an improvised stage. Read alsoWhere does Ukraine-Poland "apple of discord" come fromThe gathering, or viche, on the square did not last long, participants put out the torches and left about thirty minutes after the start. Traffic of vehicles along the central streets of the capital resumed. 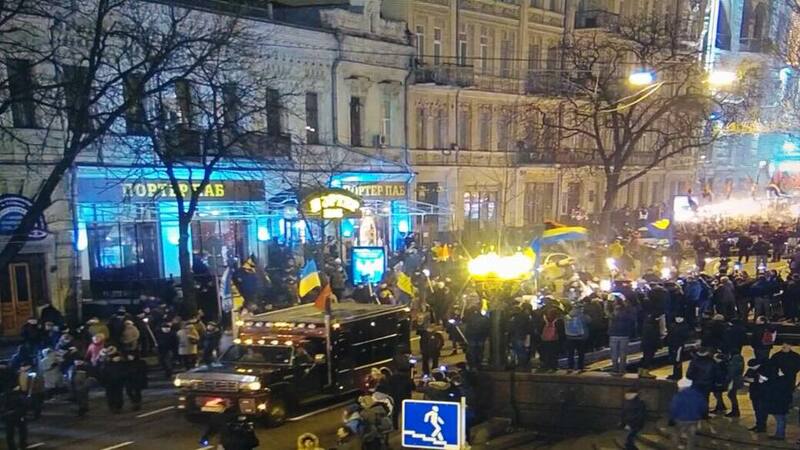 Streets downtown Kyiv are crowded, but the situation is calm. Some 600-1,000 people took part in the event in Kyiv. About 100 police officers were maintaining order during the march. Ukraine's National Police reported about 54 rallies had been scheduled in 20 regions across Ukraine to honor Bandera on January 1. Over 8,400 people were expected to attend. Some 1,200 police officers and 730 National Guardsmen were engaged in maintaining order.